“Choose Your Weapon” was the first Banksy image I targeted. As I walked about, I wasn’t sure exactly where on The Grange it was located and in what condition it would be in if I found it. Having never seen a live Banksy, I didn’t know if it would be on the back wall or inaccessible place of one of the apartment complexes I passed. Of course, I approached on the wrong end of The Grange and had to suffer the full distance before finally discovering it. Probably because of my uncertainty and confusion, it was truly stunning to run across on the street. 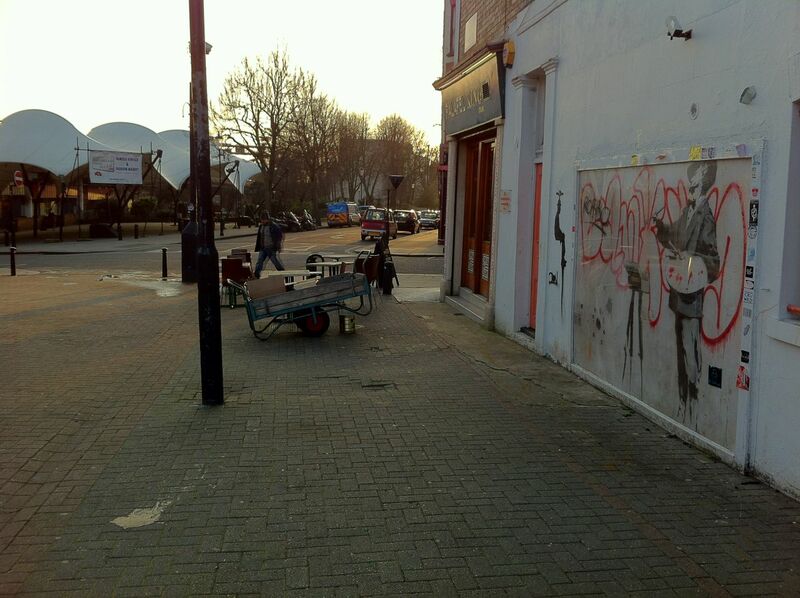 In fact, of the four Banksy’s I saw, I enjoyed it the most. 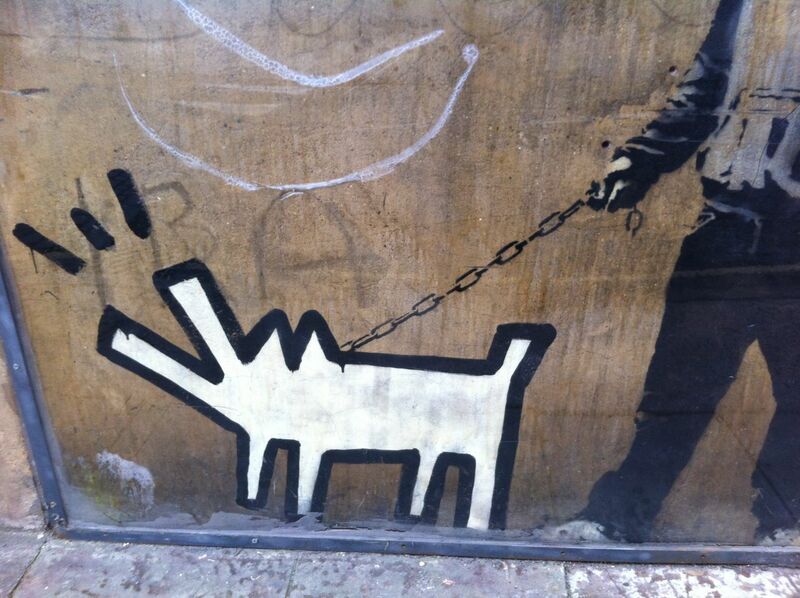 I love the contrast between the flat, abstract dog and the beautifully rendered man and chain. 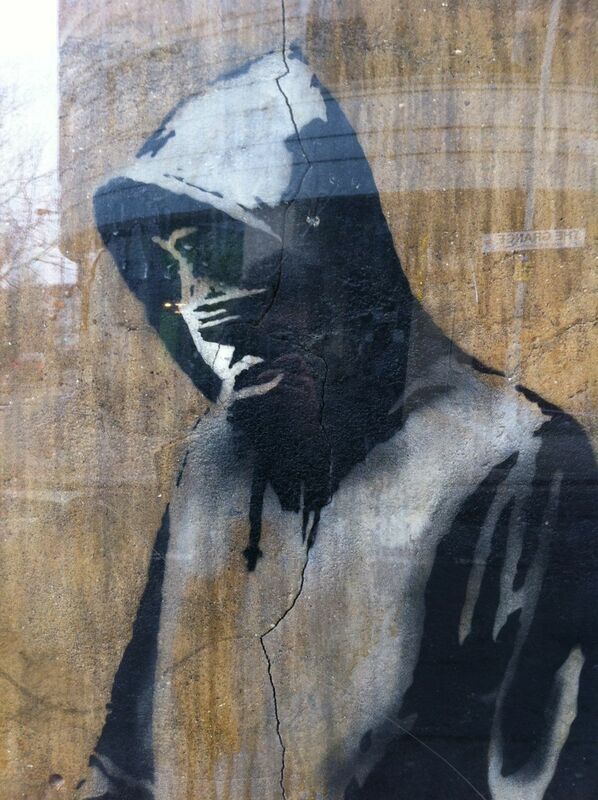 I find it remarkable that the man’s hoodie can have so much volume and detail, all via a stencil and a spray can. Amazing. Look how beautifully that chain is rendered (click image for a larger view). Hard to believe it is done with stencil and spray paint. Once again, I approached this piece from the wrong end of the street, and once again, I wasn’t sure if I would even find it or if it was still there. However, as with “Choose Your Weapon” I was hit with a bit of joy when I finally spotted it on the wall across the street. 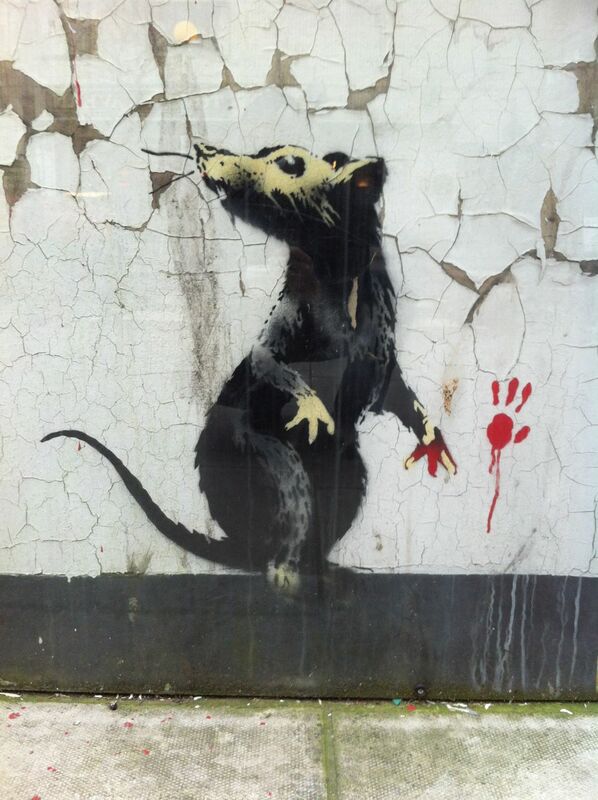 It was nice to see my first Banksy rat. Like “Choose Your Weapon” this one is protected by perspex. Have you ever looked at a rat and said, “beautiful”? 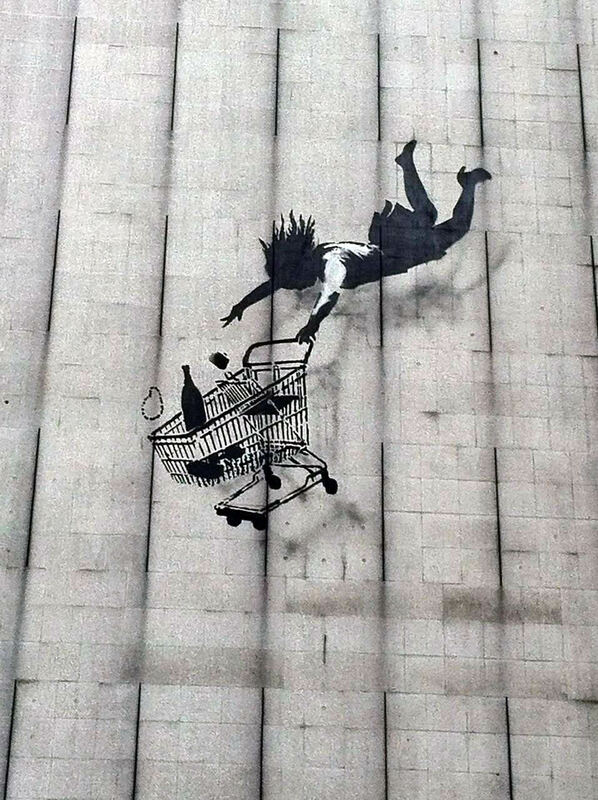 “Falling Shopper” was the only Banksy I saw which wasn’t protected by perspex. That’s because it was painted about 20 feet above street level on the side of a building. 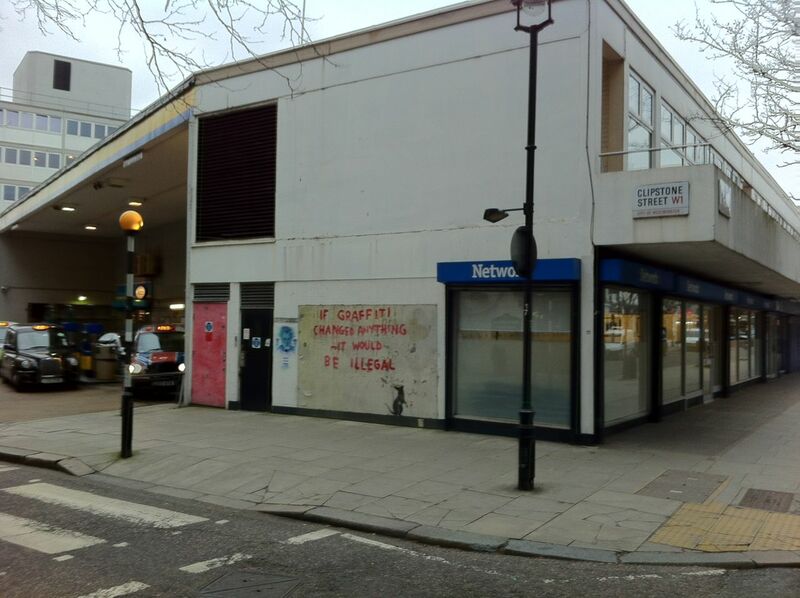 It is located in a part of London with a high density of upscale shops, certainly on purpose. I love the soft, subtle shadow under the girl and shopping cart which pops it off the wall. 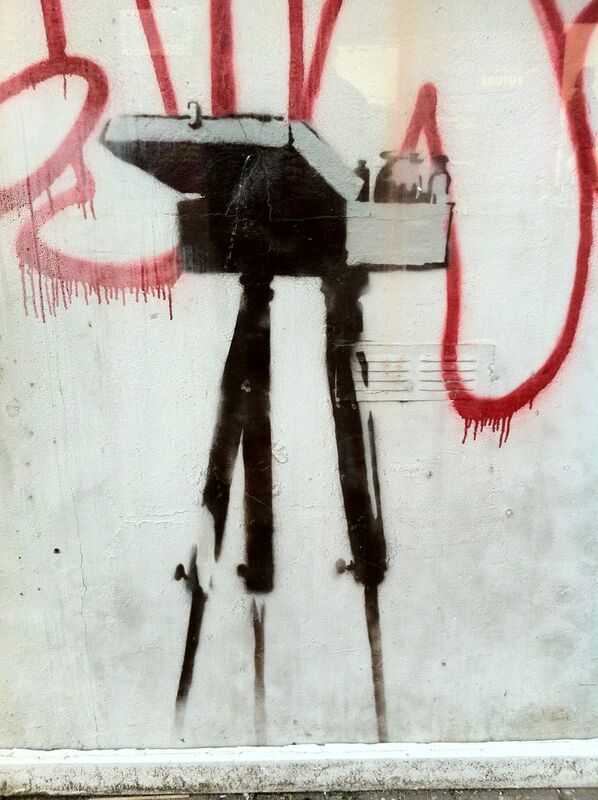 “Graffiti Painter” was the last Banksy image I found and was my second favorite of the bunch. I love the contrast of the traditional graffiti tag with the classic Banksy stencil-rendered man carefully painting that tag: clever and beautiful. 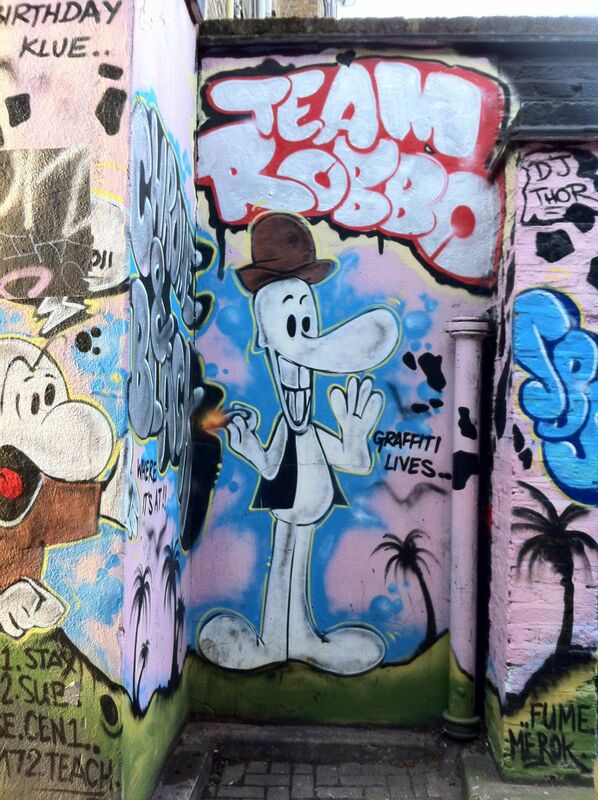 This one had the added drama of the “Robbo” over-tag. 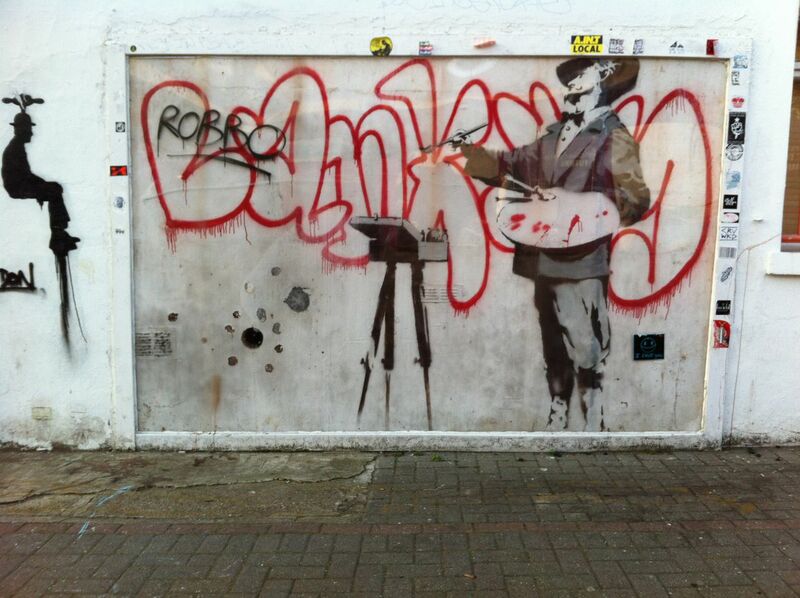 See the abbreviated story of Banksy and Robbo on Banksy’s site here and a Robbo-centric side of the story in the TV documentary, “Graffiti Wars“. While you are in the Notting Hill area, check out the close-by and fun Museum of Brands, Packaging and Advertising. 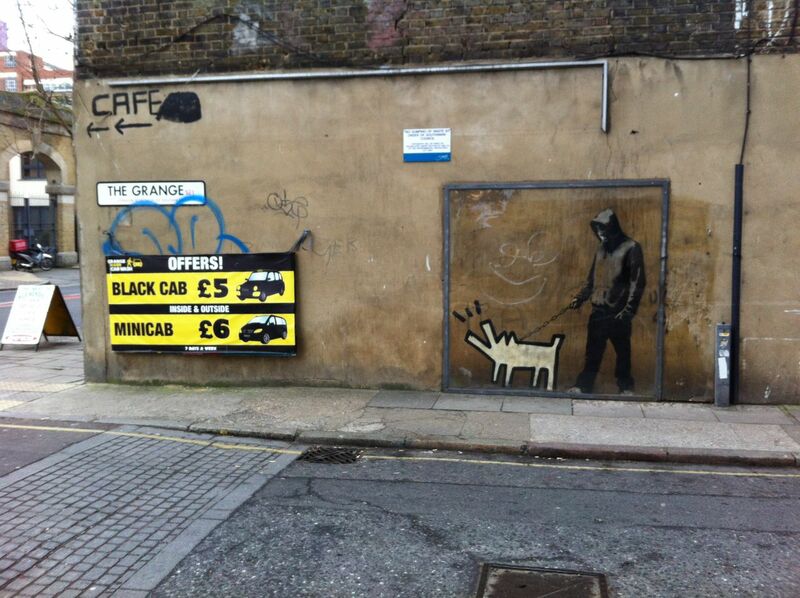 It will put you in the proper mood to receive the advert-hating Banksy. My Banksy-day was a small but enjoyable introduction to the London street art scene for the low, low price of a £7.20 all-day tube pass. Whether you love Banksy or hate him, you’ve got to respect the man’s mastery of cardboard, an x-acto blade and a spray can. 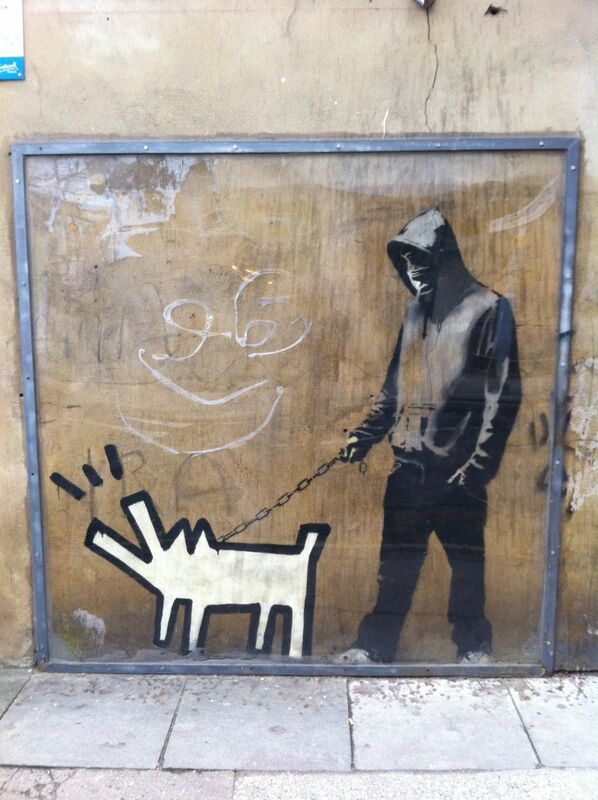 I came to London a fan of Banksy and his work. I left an even bigger one. Great summary, Mitch. I’m off to London next month and will follow your path! This is graffiti??? It’s beautiful! I happened across the “If Graffiti Changed Anything” mural a while back and had no idea why it was covered and protected. 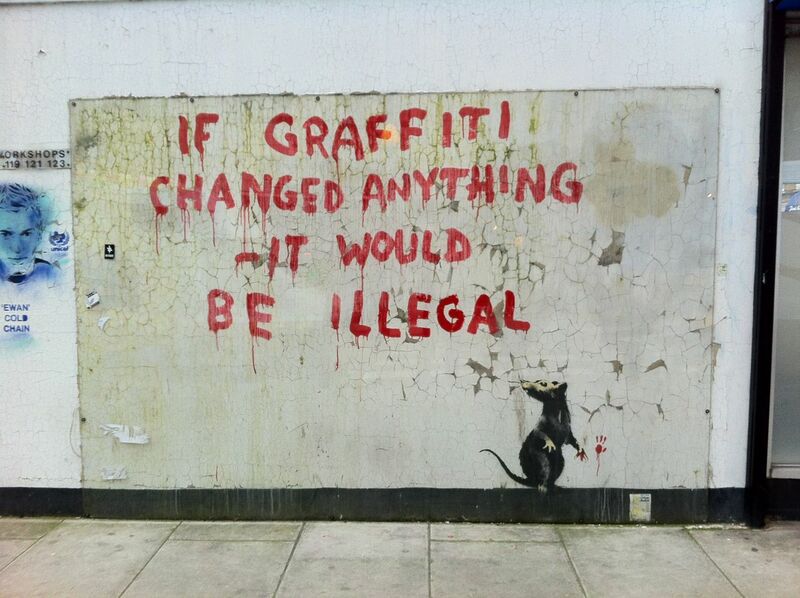 Banksy, huh? Thanks mate! By far the best map, tour and clear directions to Banksy on the internet. do it for a living man! 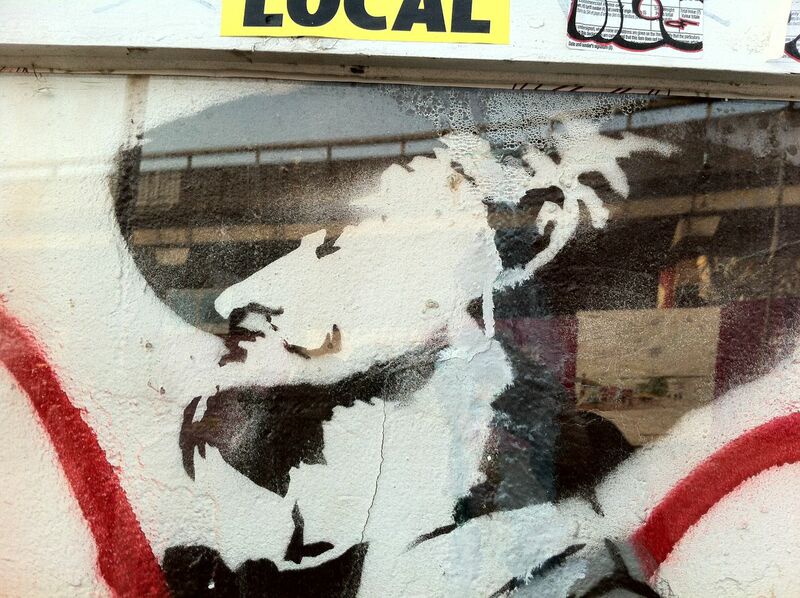 Question, we’re headed to london this week and will follow your banksy walks. BUT, we’re also dying to see the OBEY Giant on the street and have searched for hours for an exact address. You don’t know do you mitch! or anyone else? Thanks Donna. I didn’t visit any OBEY sites, so I can’t help there. 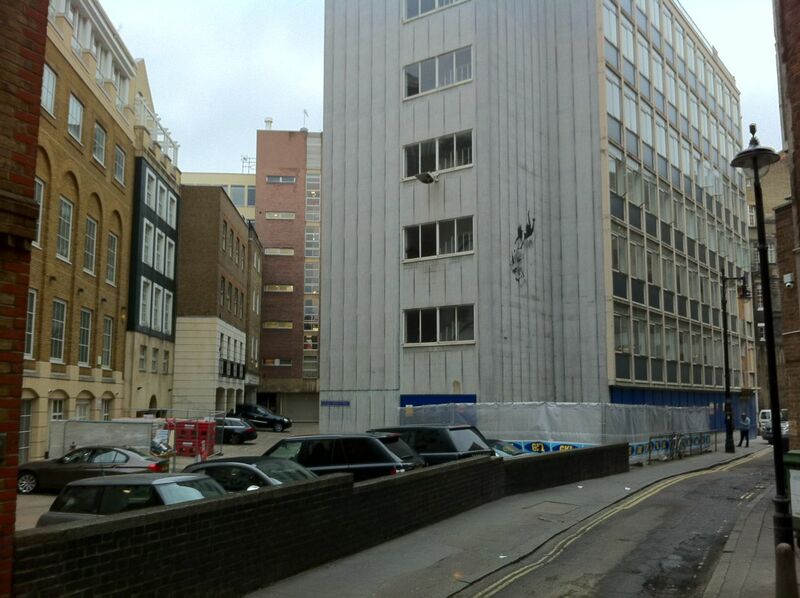 I’d be curious to hear your impressions of the four Banksy’s after you see them in person, though.